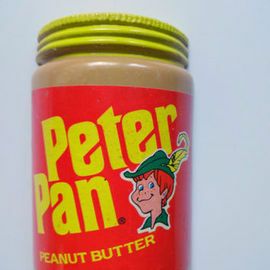 Peter Pan is a brand of peanut butter produced by ConAgra Foods and named after the J.M. Barrie character. The product was introduced by Swift & Company (originally through their "Derby Foods" subsidiary) in 1920 under the name "E. K. Pond". The product was renamed in 1928. Originally packaged in a tin can with a turn key and re-closable lid, packaging was changed to glass jars because of metal shortages during World War II, again to plastic jars in 1988, and was the first brand of peanut butter to start selling in plastic jars.